In This Article, we explain the definition of Cysts, its appearance radiologically, etiology, general classification and types. Cysts is a fluid-filled epithelial-lined pathological cavities in the jaws bones and soft tissue of the face, floor of the mouth and the neck. It may cause either intraoral or extraoral swellings that may clinically resemble a benign tumor. Classically cyst appears as a well defined radiolucent area circumscribed by a radiopaque margin. Most cysts are unilocular , however keratocyst usually has a multilocular appearance. Cysts usually do not cause resorption of the roots of teeth, but it causes displacement. The stimulus that causes resting epithelial cells to proliferate forming cyst is not exactly known . Inflammation seems to play a major role in those cysts arising in granuloma from infected dental pulp. This Classification is the proposed revision of WHO Jaw Cyst Classification. Alveolar Cyst of infants (Gingival Cyst in Adults). Developmental / Lateral Periodontal Cyst. Odontogenic epithelim: Epithelium responsible for tooth formation, read more. Non-odontogenic epithelium: oral epithelium entrapped along lines of fusion of the embryonic processes to form jaws, read more. Pseudocysts: Differ from true cyst in that they lack an epithelium lining , read more. Cysts are Pathological cavities that contains (fluid, semi Fluid or gas) which is either lined by epithelium (True Cyst) or not lined by Epithelium (Pseudo-cyst). Rarely cause resorption of adjacent tooth but mainly causes displacement. May appear as a thin layer of flattened stratified squamous epithelium like. 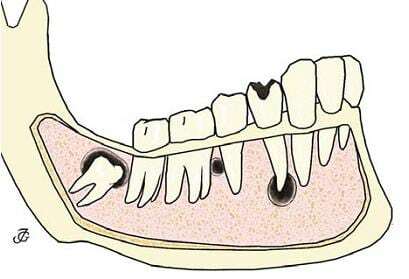 Causes resorption of adjacent teeth. Follicular ( dentigeorus ) cyst. In The Next part of Cysts of the Jaw, we will explain about Odontogenic Cysts. Dentist and Guest Author on OziDent. He earned his BDS in 2011 from Ibn Sina College, Jeddah, Saudi Arabia with honors. Currently working as a Demonstrator in Umm al-Qura University, Makkah, Saudi Arabia. His Goal is to be a Maxillofacial surgeon. In His Free time he enjoys Photography and Trying different Cuisine.